“A Digital Neurosynaptic Core using Embedded Crossbar Memory with 45pJ per spike in 45nm,” IEEE Custom Integrated Circuits Conference, September 2011. ABSTRACT: The grand challenge of neuromorphic computation is to develop a flexible brain-like architecture capable of a wide array of real-time applications, while striving towards the ultra-low power consumption and compact size of the human brain—within the constraints of existing silicon and post-silicon technologies. To this end, we fabricated a key building block of a modular neuromorphic architecture, a neurosynaptic core, with 256 digital integrate-and-fire neurons and a 1024×256 bit SRAM crossbar memory for synapses using IBM’s 45nm SOI process. Our fully digital implementation is able to leverage favorable CMOS scaling trends, while ensuring one-to-one correspondence between hardware and software. In contrast to a conventional von Neumann architecture, our core tightly integrates computation (neurons) alongside memory (synapses), which allows us to implement efficient fan-out (communication) in a naturally parallel and event-driven manner, leading to ultra-low active power consumption of 45pJ/spike. The core is fully configurable in terms of neuron parameters, axon types, and synapse states and is thus amenable to a wide range of applications. As an example, we trained a restricted Boltzmann machine offline to perform a visual digit recognition task, and mapped the learned weights to our chip. “A 45nm CMOS Neuromorphic Chip with a Scalable Architecture for Learning in Networks of Spiking Neurons,” IEEE Custom Integrated Circuits Conference, September 2011. ABSTRACT: Efforts to achieve the long-standing dream of realizing scalable learning algorithms for networks of spiking neurons in silicon have been hampered by (a) the limited scalability of analog neuron circuits; (b) the enormous area overhead of learning circuits, which grows with the number of synapses; and (c) the need to implement all inter-neuron communication via off-chip address-events. In this work, a new architecture is proposed to overcome these challenges by combining innovations in computation, memory, and communication, respectively, to leverage (a) robust digital neuron circuits; (b) novel transposable SRAM arrays that share learning circuits, which grow only with the number of neurons; and (c) crossbar fan-out for efficient on-chip inter-neuron communication. 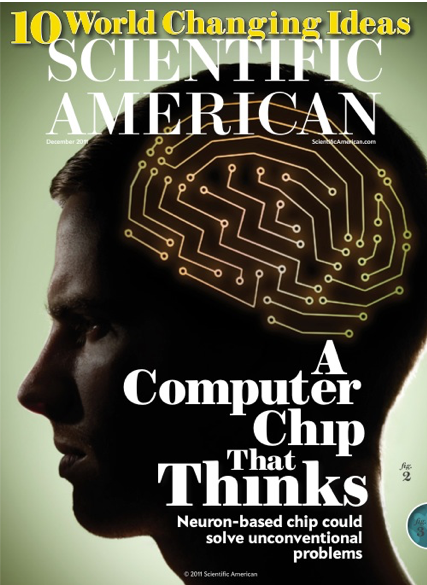 Through tight integration of memory (synapses) and computation (neurons), a highly configurable chip comprising 256 neurons and 64K binary synapses with on-chip learning based on spike-timing dependent plasticity is demonstrated in 45nm SOI-CMOS. Near-threshold, event-driven operation at 0.53V is demonstrated to maximize power efficiency for real-time pattern classification, recognition, and associative memory tasks. Future scalable systems built from the foundation provided by this work will open up possibilities for ubiquitous ultra-dense, ultra-low power brain-like cognitive computers. As part of IBM’s centennial, IBM organized “THINK: A Forum on the Future of Leadership” on September 20-21, 2011 that I attended. 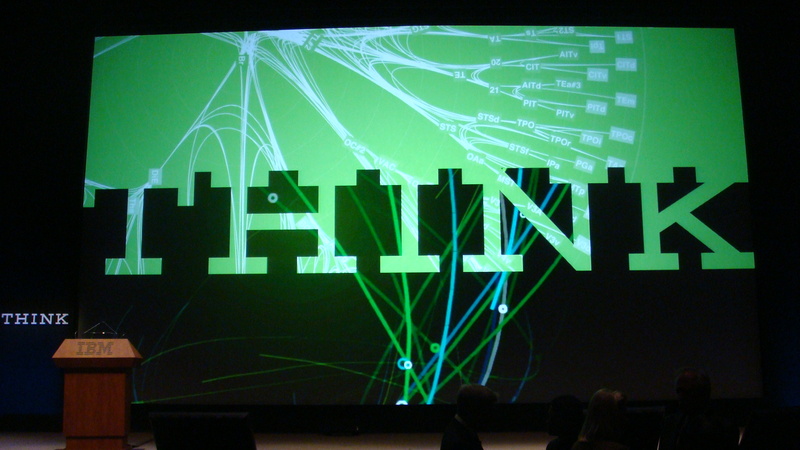 Our long-distance wiring diagram of the macaque monkey brain was merged with IBM’s signature word “THINK” to create a logo for this distinguished event. Steve Hamm, co-author of Making the World Work Better: The Ideas That Shaped a Century and a Company, interviewed me on the challenge of bringing together a multi-year, multi-disciplinary, multi-institutional collaboration. The video is here.